That very talented chap David Manley has gone and done it again. 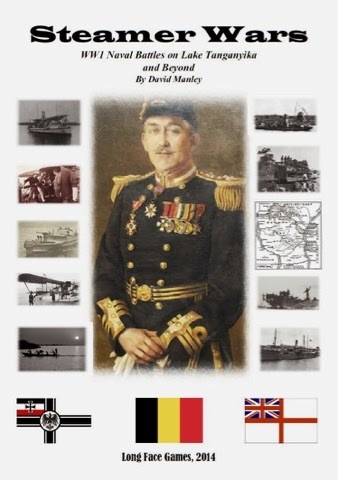 The latest additions to his growing range of naval war games rules are covering a subject very dear to me - that of gunboat operations, both as naval engagements in their own right or in support of land operations. Steamer Wars are designed with the naval battles that took place of Lake Tanganyika during the Great War in mind but are readily usable for just about any similar sized operations set during the period 1910 to 1920. These are not the great clashes between dreadnoughts, rather they are small scale, almost low key affairs that occasionally use purpose built vessels (usually where the power in question has an established presence) but more often than not using civilian craft pressed into service with a couple of guns hastily added. David has included in the rules not only a rather good campaign system for those wishing to refight the campaign but also some more generic ship statistics so designing your own scenarios is readily catered for. As an extra bonus the rules also include the presentation given by Commander Spicer-Simpson in 1934 which makes for an interesting read, albeit a trifle biased! I am not about to give a detailed overview of the rules as they are available readily enough (and cheaply enough!) from the Wargames Vault. You will also find River Wars which is a supplement to the main rules covering operations on the Danube - and seeing the Austrian Danube monitors in action I defy anyone with a taste for the 'odd' not to be impressed! - and includes ship stats and rules for land based troops, mines, booms, cables and torpedo attacks. I am working on adapting these rules for use on a hexed playing area - simply so I can tie the action in with my own land based ideas. I do not have any plans to tackle Lake Tanganyika, fascinating as it would be, but the rules have given me a number of ideas for Fezia and Rusland. My plan is to have the border between the two nations separated by a river sourced from a lake - and this is solely so I can have some riverine action using gunboats and the like. I want to scratch build some models for this and believe that the numbers I will need are small enough to be cobbled together easily enough. It will certainly make a change from messing around with dreadnoughts - more of which in the next post. After a busy weekend due to an overnight stop in Ipswich with SWMBO for a very enjoyable music event I was this afternoon able to make a start on painting the first of the 40mm plastic figures for the 1930s Fezia and Rusland project. I managed to find a box of assorted acrylic paints lurking in deep storage in the man cave - some GW and some from the Orcs Nest in London - which will be sufficient for my immediate needs although I will need to add a couple of shades to the selection. The first batch of figures - 24 in all - are for the Ruslanders and the base coat for them in Khaki. The base uniform coat has been applied so next will be the details - equipment and flesh etc. It is funny though how the application of paint really emphasises just how bad these figures are in terms of details. To anybody that can remember the old Spencer Smith plastics you will know what I mean! I am enjoying the process though and will hope to get these finished in a couple of weeks or so. It has been a long time since I painted plastic figures but I am keen to push on with these and get them into action. I have some terrain for use with the models and have also settled on how the tanks will take shape. They are going to look suitably 1930s but I will not be doing anything with them until the infantry for both sides is ready. It has been a pretty productive weekend both on the domestic and gaming front. This afternoon I was able to get the 50 x 40mm plastic figures for the 1935 Fezian and Rusland undercoated so the next step will be to tackle the painting in earnest. I have the colour schemes worked out and am already thinking about further additions - primarily support weapons and crews and any 'specials' I may want to add. Machine guns and mortars are the obvious first port of call but I will of course be looking at artillery crews - especially now as I have a good source of wheels. The figures are going to be gloss varnished but I will be adding to the bases. My standard method is to add coarse sand to PVA and then paint and highlight the same and so I shall be doing this in due course. As befits armies operating in what is effect a desert environment the bases will be sand/brown/rocky/dusty and whilst deciding this I rediscovered a couple of bages of palm trees which will be ideal for what I am planning. I have also been thinking about the whole tank thing. The 1930s was a great period of experimentation in respect of what tanks should look like and how they developed tactically. I want mine to reflect this and so will producing both anti tank and infantry support version - possibly even some machine guns armed types. I rather fancy cobbling together some armoured cars as well. Lots to play around with then but the infantry must come first of course. The 40mm Fezia and Rusland 1930s collection has just gained some armour! I have been pondering about how best to model some tanks for both sides in 40mm and was more or less resigned to scratch building some suitably generic looking vehicles. The main problem I was trying to avoid was one of table footprint. Any vehicles for this project need to fit on a Hexon tile which is 4" across the flat sides. Any vehicles would also need to be proportionally taller so that the figures looked right alongside. Bob Cordery mentioned a while ago that he had seen some tanks in a local pound shop so I made a mental note to scour these at the earliest opportunity. Up until now I had been unsuccessful but today that all changed. By no stretch of the imagination would I use these as they are but as the raw material to create something unique and more in keeping with how I visualise the tanks of the period looking they are ideal. You get two of the above for 99p and despite the almost Games Workshop Warhammer 40K look they are rather cleverly put together. the track sections detach and the white knob you can see protruding from the side is to wind up the motor. Needles to say that will be removed and so I took one to pieces. The engine has two rather nice wheels that are ideal for use on artillery gun carriages which is an added bonus (and saves me having to buy them!). The turrets are fixed and the strange radar dish at the rear comes off, as does the muzzle brake. I will certainly lose the gun barrel and will replaced it with something a little more reasonable in terms of calibre. The two figures are alongside so you can get an idea of the scale. All in all not bad for 99p - so I purchased four packs and immediately wished I had gotten six instead! The next purchase was a little beauty! Wilkinsons are now operating a 'pick and mix' in their hardware section for nuts, bolts, screws, nails and washers. A small bag is £1.99 and the large is £2.99. In the past I have never used washers for figures - usually because the washers tended to be dearer than the equivalent use of a 1p or a 2p coin. In the above deal I was able to fill a large £2.99 bag with 166 30mm washers and 147 25mm washers which works out at less than a penny a go. They are also magnetic. The larger of the two sizes were used this afternoon to rebase the 50 odd 40mm figures I am working on - it was a darned sight easier than clipping and filing the 30mm plastic square bases they were originally mounted on I can tell you! I am now back on course to get he 50 figures undercoated this weekend so that the painting can begin in earnest. I shall also spend some time looking at tanks - which is never a great hardship! The eastern border between Fezia and Rusland is a bleak and desolate place. A number of small and nondescript villages either side of the notional boundary, a couple of small mines and the inevitable small holdings largely constitute the entire region. It is an arid and inhospitable landscape, devoid of any major industry or significant human endeavour. Yet the inhabitants manage to eke out a modest living from the parched hills and valleys - sheep and goat herding mainly but with the occasional tea plantation or coal mine - and have done so as far back as anyone can be bothered to remember. Where the land fails to provide sustenance then there are always those hardy souls that exist beyond what passes for the law in those regions - brigands and cutthroats for the most part, freedom fighters on occasion. It had not always been so. Centuries before the land had been carefully irrigated and garden crops flourished. The area grew prosperous and the two nations coexisted amicably, happy to maintain the status quo. Sadly for both sides covetous eyes from far away turned their attention to the region and so the armies from either side marched. The region has changed ownership on numerous occasions - first being under Fezian rule and then Rusland - with neither party able to maintain exclusive sovereignty for long. To be living in what was almost a constant battlefield shaped the region for the worse as gradually the more prosperous elements of frontier society, no doubt tired of seeing the fruits of their labours destroyed by marauding armies and brigands, moved away and their estates went to ruin. The geography of the region is such that inevitably large armies starve and small armies get beaten. To the north and south of the whole area lay regions of desert-like wasteland, across which any army must be supplied. The river that flows from the Eastern mountains, effectively the border between the two sides, terminates with an extensive delta upon which both Fezia and Rusland have established harbours. Their close proximity (they face each other directly and both sides have forts in place) means that in the event of war they are easily neutralised meaning that supplies must come overland. Attempts to build railway links on both sides have only been partially successful so long columns of wagons and camel trains with the occasional convoy of lorries is the normal method of supply. Both Fezia and Rusland have fought over this region largely for reasons of propoganda as there is little of intrinsic value in the region - certainly insufficient to justify an invasion but then prestige and martial pride usually provide the spur. Punitive expeditions to bring the region under either rule tend to be a fairly routine occurrence but are usually short lived. Typically either side realises that the cost of maintaining a viable military presence in such a region far outweighs any territorial or economical advantage and besides, their respective treasuries are perennially short of funds for such adventures. So one side or the other will launch an 'invasion' to restore the region to Fezian/Rusland rule amid great fanfare and public acclaim. There then follows a stubborn defence. This invariably fails to stop the 'invasion' (usually as the defenders, despite ample warning and the lessons of history are woefully inadequate for the task) so the political counteroffensive inevitably brings the fighting to a halt. The 'victors' will then proclaim the territory as now being Fezian/Rusland whilst the politicians argue it out. Whilst this is going on the occupying army begins to lose enthusiasm as supplies dwindle and with a rapidly diminishing treasury until eventually, with as much dignity as it can muster, retires to its original positions. Peace breaks out. The inhabitants of the region are well used to this sequence of events and for the most part are largely indifferent to whoever is the notional ruler - they just go about their centuries-old business in the same old way, unmoved by the vagaries of fortune or a ruler's occasional itch for conquest. the book that accompanied the series. 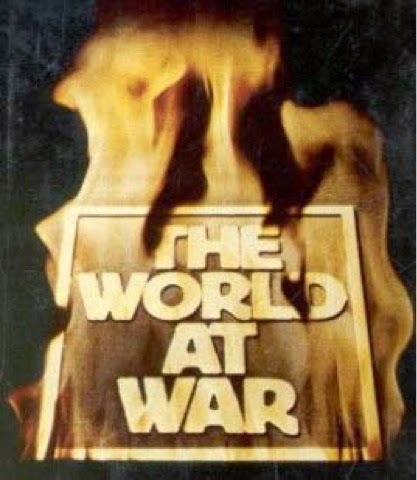 Courtesy of the BBC I have just completed watching all 26 episodes of the documentary series: The World at War. This widely acclaimed series needs little introduction from me but, if I am honest, it has had a greater impact on me this time around than it ever did in 1973. As a young boy bought up on a diet of Commando and Battle comic books and endless supplies of plastic models seeing images of real tanks and soldiers, sailors and airmen in action was an exciting experience and fuelled many a game using Airfix figures and Charles Grant's Battle: Practical Wargaming. The series made for compelling viewing and I suspect that I probably had little time for the 'boring' interviews and the seemingly more mundane aspects of the conflict - the political and human dimension. I wanted to see action! Such is the limited attention of a 13 year old. Fast forward a few decades and I have just finished watching the entire series again. It is safe to say that the experience has been altogether a very different one. True enough the 'action' sequences are still as enthralling as I remember although the previously 'boring' interviews have taken on a new significance with my more rounded and mature outlook - 40 years of reading and research have ensured that my understanding of the conflict is far better than in 1973. The human dimension though has had a much bigger and if I am honest, more harrowing yet uplifting impact. You can see the suffering and with the benefit of advancing years and of hopefully a greater level of emotional maturity can understand at least a little of what those people went through. The nature of loss. The nature of death. The true enormity of a conflict that consumed the world and that changed it forever - the redrawing of international boundaries down to the death of a beloved relative - is really what this series is all about. The war impacted the world at every level and showed no favours to any nation, race or creed. The pain of loss of a close loved one knows no boundaries whether you are British, German, French, Russian, American, Japanese - the grief is universal. As a technical achievement the World at War is a magnificent piece of work. The footage, interviews and narration is first class. It has the power to inspire, horrify, anger and shame by turns. Above all it has the power to make one think. To think about the truly global epic of the war and and how humanity was able to, in the space of a few years, demonstrate every emotion and passion from the heroic and noble sacrifice to animal levels of bestial behaviour. All human life is here, for good or ill. In closing it is fair to say that I have struggled to get the right words out for this post. The images I have seen have affected me deeply - more so than I would have expected - and form a balancing counterweight to the purely martial dimension, the dimension that we as war gamers routinely enjoy. This is something of a no-brainer in many respects as the 'imagi-nations' in question are those two old adversaries of Rusland and Fezia. The historical situation as I envisage it is centred around a longstanding border dispute - longstanding as in centuries old. The rationale behind using this as a kind of causus belli is that when I tackle the 19th century the spade work in terms of the campaign map etc will already be in place. The forces for the 1930 version of this continuing struggle are going to be very much in the nature of an experiment. To begin with I am using possibly the cheapest figures I have ever found and in a scale that does not lend itself well to such things as vehicles, artillery etc. Irregular Miniatures produce a large amount of usable kit in their 20th century range but, if I am honest, I rather fancy knocking it up myself. The tanks will be quite small in any event - machine guns and light calibre main guns at best - and I reckon that making a suitably generic series of simple vehicles should be easy enough - the figures are very crude so the models do not need to be super detailed. Artillery is a little more problematic but I shall only need a field gun and possibly a small calibre anti-tank gun in any event. Bob Cordery drew my attention to the Airfix 20mm 5.5" gun and suggested that with a wheel change and the addition of a simple shield would suffice for a infantry type gun. With the barrel cut down it should provide sterling service. It certainly got me thinking I can tell you. Mental note: I must source some wheels scaled for 40mm - perhaps a call to that very nice Ian Kay at Irregular Miniatures may be in order! Mortars and machine guns could be scratch built as well and I am thinking along the lines of something akin to a Hotchkiss for the Fezians and a Maxim for the Ruslanders - not sure about the wheeled version though! The first order of business though is to get the infantry ready and I have spent some time on this today despite having hit a minor snag. Originally I had based the figures on a 3cm square plastic base from Peter Pig. It is a little on the large size so I decided to round off the corners. This has involved cutting off each corner and then rounding it off using a file. It is not difficult, just messy and time consuming and also has made my still recovering hands ache somewhat. The end result looks a lot better though and so I will be able to start the serious job of painting over the next few days. I have just returned from a rather pleasant couple of days in Norfolk which included a visit to Cromer - the home of the crabs. 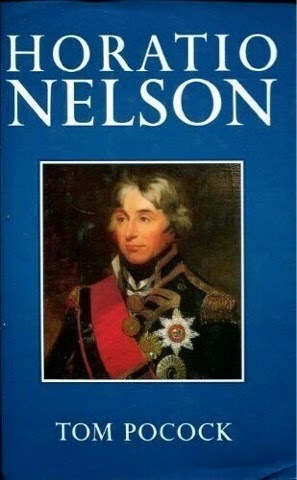 Aside from the bracing sea air and a couple of rather good secondhand bookshops (and a pretty good model shop as well) I managed to pick up a copy of Tom Pocock's biography of Nelson from a charity shop. I carefully sorted the figures into types and then put to one side those that I had earmarked for some long forgotten project. I even went as far as cleaning up the first batch, washing them in detergent and basing them on 3cm squares. My whole 'imagi-nation' project list has given me much to think about - with lots of my ramblings appearing on the blog as various points as my enthusiasm for a particular idea waxes and wanes by varying degrees. I am committed to something 19th century related in due course but in the meantime I need to try a few ideas out. One of these - and certainly the most readily achievable - is to revisit the notion of a 1930s or early WW2 set up making used of the figures shown in the blog entry above. This will serve to tackle a number of things. Firstly, it will get me painting some figures for a change and this is in turn a test bed for some techniques I want to try. Secondly, it will enable me to actually get some figure games in. Thirdly, it will give me the opportunity to 'flesh out' Rusland and Fezia in the 'modern' era. I could go on with other benefits but the best of these is the simple fact I will be able to mess about with some kit bashing for vehicles and heavy weapons. I plan to use the resultant collection for Memoir 44 type games as well using a hex based version of Charles Grant's Battle: Practical Wargames which I have been messing around with. These are designed with 1944 era games in mind but the core system is readily adaptable for the earlier period. At the time of writing this I am planning the uniform details for the two sides - green and brown seem to be the likeliest choices although the idea of a grey army for obvious reasons has some merit, I shall have the figures undercoated and primed with the base colour over the Easter weekend and then it will be on with the detail work - and trust me, with these figures that is hardly an onerous task!